Today I spoke with a woman who now works for a non-profit and who was a Bible teacher in a religious school. I so appreciated the time she took away from her work for our conversation. I’m lucky to have had the chance to meet her; in the course of our normal lives I suspect we would not have encountered each other. She lives in a small Jewish settlement far into the West Bank, and her husband runs a mechina (yearlong program between high school and the army) there to get students ready for the army. I would have loved to have asked her many things about her decision to be a settler. We did not talk politics, however – we talked religion! What brought you into teaching? Well, my father thought teaching good job for a woman. Also, I thought would be interesting. I wanted to work with people – that’s why I became both a school counselor and teacher. The teacher’s college was near my home. So it was natural. I really wanted to teach but keeping discipline in the classroom became too much. Sometimes here we have 39 kids in a class. I wanted to talk about the Tanakh, what the students thought it meant. Especially in religious school,it’s not the first time the children have seen these stories. They’ve known them since gan, since kindergarten. So I wanted to talk about it with them. But there is not enough time with all of them. I tried to do some of that, but with the exams coming up I had to write it all on the board and have them copy it down. Tanakh should not be just knowledge, not just something to know. It is part of their lives. Now I feel like I do that work with my own children. Why did you choose to teach Tanakh? I knew it so well from the time I was a girl. Though I learned so much more about it when I became a teacher. What are some of the differences between religious school and secular school? I don’t know so much about what is happening in the secular schools. They teach Tanakh, but just enough to know it, to pass the exam. In religious schools it is much much more. The exams are completely different. We use Rashi and Rambam and the Talmud. It is very complex, very rich and deep. In religious schools, the students are living in the modern world and also living religious, just as my family and I are. So that brings up a lot of questions. 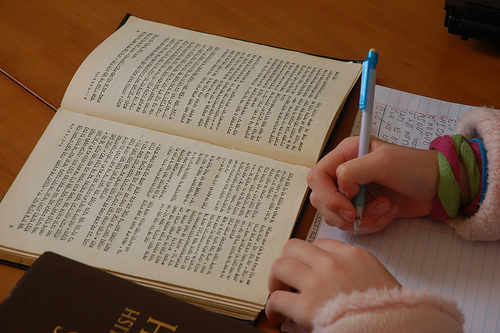 It (studying Tanakh) is not just for school. It is about your life. You use, for example, the Psalms when thinking about the day. What kind of a range is there in how religious the families are in the religious schools? Were there families who had debated between religious and secular schools? It depends on where you are. In our school there were religious families, and there were also non-religious families who wanted their children to go to religious schools. There were the families who just go to synagogue on Rosh Hashanah – the ones who are more lightly religious. Were there any who debated between Haredi (ultra-orthodox) and Dati (religious) schools? Very few – very few. The Haredi system is much more closed. If you were to go to a Haredi school, they would want to know who your family was, that you were Haredi. Do the religious schools teach about other religious traditions? That is a good question! All throughout my schooling, never. Where I got my BA, we had a library, a library with two large floors. On the first floor were the Holy Books – and it was full. On the second floor were all the other books – psychology, sociology, etc. I went looking for the Christian Bible and the Qur’an. I found them – they had them – on the second floor, way in the corner out of the way. Would they have come up in history? Maybe, maybe one sentence in history, but not as religion. When we finished she offered to speak with me more, so I look forward to more conversations with her.